Jacques Cœur was born in Bourges in around 1400. He was the son of a fur trader. He gradually built up his business empire, starting as a wool trader before marrying Macée de Léodepart (1420). 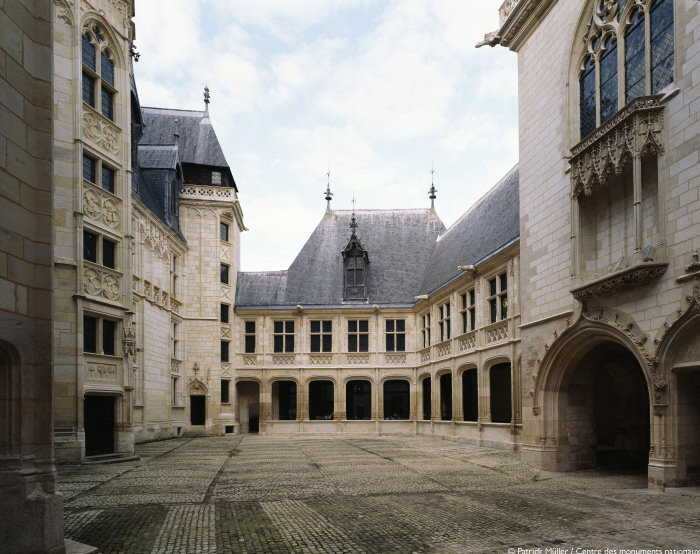 As a result of his new connections, he gained positions first at the Bourges mint, then at the Paris mint (1435). He continued to expand his empire, founding a general luxury product store in 1430 aimed at rich clients and the royal court. He also had a vast fleet that travelled as far as the Levant. His business relationship with King Charles VII, his favourite Agnès Sorel and the royal court took his career to new heights. In 1438, he was appointed Master of the Mint – a powerful commercial enterprise – by Charles VII, and granted a noble title in 1441. He was subsequently sent as one of the Royal Commissioners to preside over the new parliament of Languedoc, and in 1447 was designated General Inspector of Salt Taxes. In 1448, he participated as an ambassador in the mission to pledge France’s allegiance to Pope Nicholas V in Rome. On July 31st, 1451, Jacques Cœur was arrested at the Château of Taillebourg, on the order of Charles VII, on the charge of having poisoned Agnès Sorel. Although this charge was quickly dismissed, further accusations followed and his career and reputation lay in ruins. He subsequently escaped from the château of Poitiers, and reached Rome, where he sought refuge from the Pope. Callixtus III appointed Jacques Cœur to lead a crusade against the Turkish invasion in Greece, during which he died on the island of Chios.